Weekend getaways are always such a thing. Being based in Vienna, options are plenty with destinations such as Lisbon, the Balearic Islands, Greece or Tel Aviv - just to name the ones most demanded in 2018. But when you did so many crazy things already, this looks like an option everyone can do. So well, why not taking advantage of Austrian Airlines’ recently launched light fare to North America with only hand luggage? I mean if they start selling a no-baggage tariff there might be a reason behind it. On a scale from 0 to 10 how crazy is it to go to Chicago for a weekend trip? And a weekend means leaving Europe on Friday at 11 am and going back from the US for Europe on Sunday afternoon. Since I was totally into the idea to get a hop over the lake in Business Class, I booked this trip knowing I wouldn't get much sleep. What I needed was a solid luxury hotel that isn’t too much American mainstream. 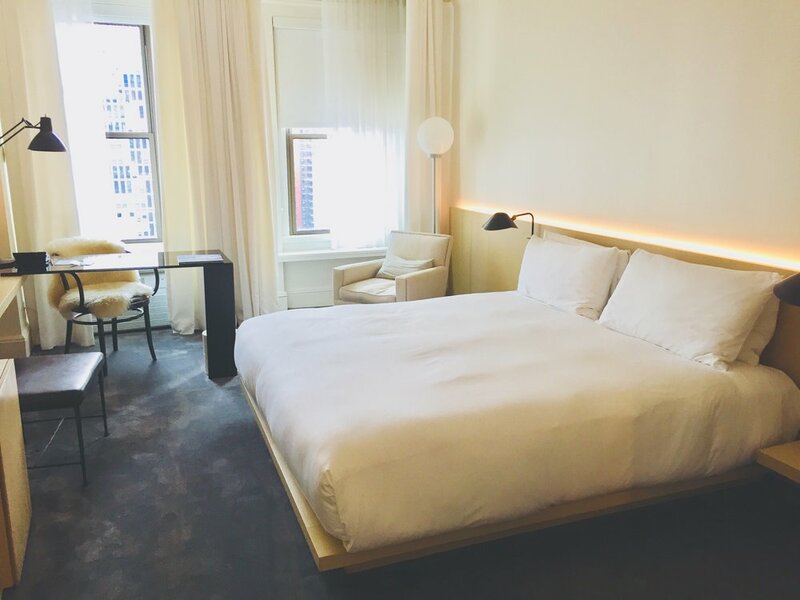 Interestingly, Chicago’s hotel scene is no short in cool hotel concepts, however, I always wanted to stay at a hotel designed by no one else than Ian Schrager. 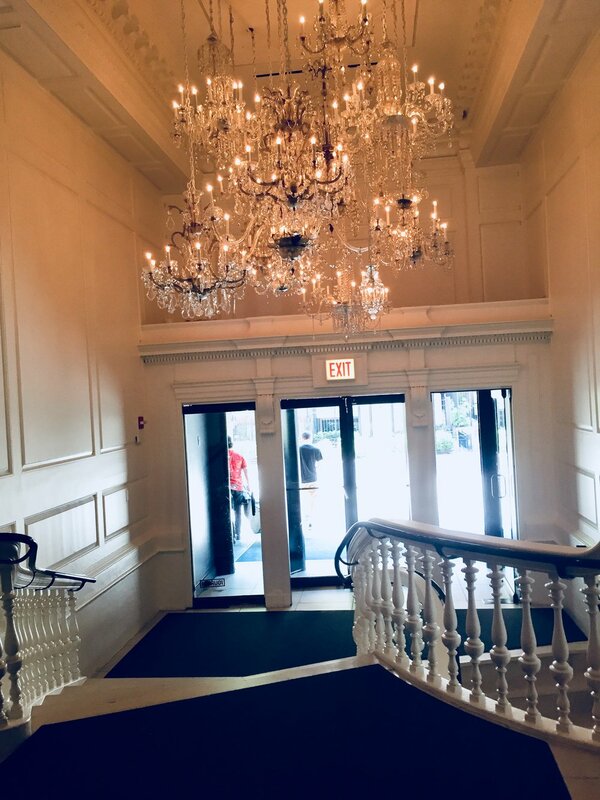 That’s when I booked a room at the Ambassador Hotel (formerly known as the Public Chicago) in order to feel the cool spirit and being impressed by a new design and interior style. Pre-departure I got some recommendations from our US Expert Vivian, who couldn't tell me much about the location so I was hesitating if the location of the Ambassador Hotel is good enough for the short stay. Obviously, I wanted to make the most out of this short time in Chicago. Anyways the biggest of all problems was Chicago traffic. It took me an hour and a few minutes from the O’Hare Airport to the amazingly located Hotel Ambassador. To all my surprise, the hotel is actually located in the third row to Lake Michigan and the promenade could be reached in under a minute walking. Next surprise was the complimentary bike rental by the hotel - even though I did not manage to find out if it is prohibited to use the pedestrian way in the US. Anyways, riding a bike didn’t seem to be as fashionable as taking an Uber or Lyft here. Check-in went extremely smooth and the staff handed the keys over to me in under a minute - welcome to the birthplace of efficient check-ins. My room was on the 14th floor (in total there are 17) and I had one that was overlooking the John Hancock Center as well as the Four Seasons - so basically it was overlooking central Michigan Avenue. At this point, I have to say that I totally loved the layout of the room as it felt unique even though it was similar to any hotel room in the world. All the design finishings and lights made the room very beautiful and bright. The cool carpet and wood panels gave the interior design a perfect touch. Obviously, the center of the room was the huge king size bed that was extremely comfortable (well, after coming from Europe your day is even longer so, of course, I slept like a baby). There was a writing desk in front of the window with power sockets as well as a chic armchair overlooking the skyline. Further amenities include a television, huge minibar as well as a convenient in-room shop where items like caps, Marvis toothpaste, and further cool amenities could be purchased. I really loved this stunning idea and would also include it in a hotel if I ever operate one ;). While the room looked totally new and stylish, you could actually see the original roots of the hotel due to the shower-tub combo (although I would not use the low bathtubs) - anyways the white bathroom fitted perfectly into the design in the end and was not a little issue for me. The toiletries were by Maison Marigela and smelled quite refreshing. As usual in a solid five-star-hotel in the US, the toilet was not separated and there were limited amenities provided. Since the hotel sold Marvis toothpaste and a shaving kit, I assume there is no such thing as complimentary guest products like a toothbrush or shaving kit. In the end, I hesitated to ask and unpacked one I took from the luxury stay in Capri. Housekeeping didn't arrive for a turndown service (I wouldn't have expected one at a four-star rated property) but since I was staying in the room on my own I was fine with the two bath towels. The following day, the replenished the towels of course and even added another set of toiletries which I think was very attentive. Since the main purpose was to explore Chicago, I didn't plan to spend much time in the room - however, in the end, I spent quite some time digesting the amazing skyline views. I left the room after I took a post-flight shower and changed into summer fit clothes - hello 90 degrees Fahrenheit. On the bike driving through this huge city, I felt like the flight was days ago and could immediately start enjoying the city's architecture and its many shops along Michigan Avenue. I passed the river to have a look under the Cloud Gate in Millennium Park before I drove to the Navy Pier for a real US beef and fries along a Chicago brewed beer on the shore of Lake Michigan before I drove into the sunset filled Goethe street which is filled with the city's most picturesque luxury condominiums and the Ambassador Hotel. 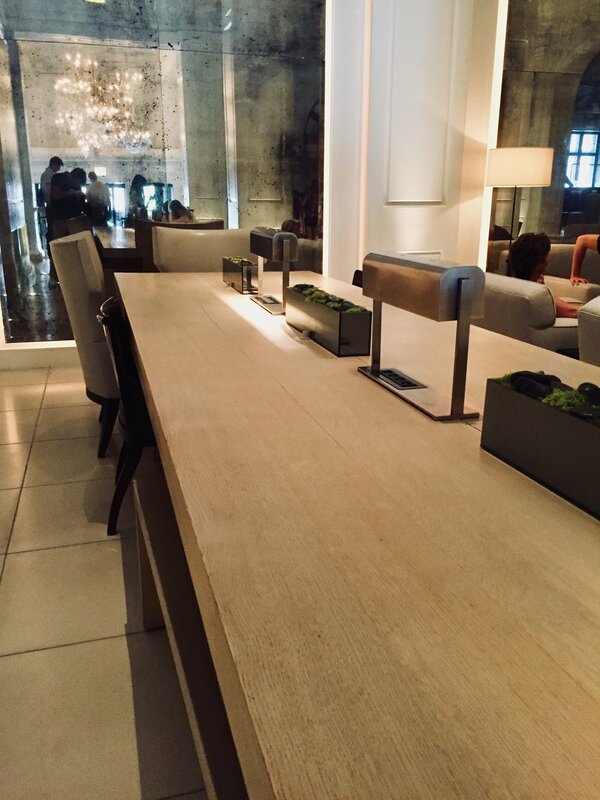 Well, the location wasn't Four Seasons or Peninsula like, but at a third of their rates, you get a chic hotel in one of the most sophisticated areas of town a bit off the bustling Michigan Avenue. On the next day, I did some more sightseeing and then queued up for a prime seat at the Signature Lounge at the 95th on the John Hancock Center and then spent the rest of the afternoon sipping Rum Punch and some other local drinks to watch the sun set over the capital of Illinois. Since I wasn't in the mood for the fanciest dinner in town, I headed to a local diner serving one of the best spare ribs I have had in ages. The rest of the evening was spent in a Chicago Classic: Andy's Jazz Club. Another sleep later, I headed to the 3Arts Club Cafe for a late breakfast (note breakfast is generally never included in US Hotels) and it was amazing. Also, if you are traveling on a lower budget head to the building (Restoration Hardware Chicago), bring a drink and walk up to the rooftop. It's not even one of the most stylish rooftops in the world, it's also without service meaning nobody rushes you while you enjoy the orange sky slowly meeting the skyscrapers of this bustling town. The following morning, I asked for a late check-out which was granted without further discussions and free of charge so I had a quick shower after another walk and then changed into the business attire in order to arrive in style back in Europe. A few glasses of wine, a delicious four-course dinner as well as a breakfast on my Austrian Airlines flight later, I found myself in the office at 9 am. That was one hell of a weekend. I was guest of the Hotel Ambassador Chicago, however all above written expresses our own opinion and has not been influenced.